ISLAMABAD: As the body of martyred superintendent of police (SP) Tahir Dawar was handed over to Pakistan by Afghan authorities at the Torkham border crossing on Thursday, Islamabad pointed the finger at Kabul over the cold-blooded killing of the police officer. 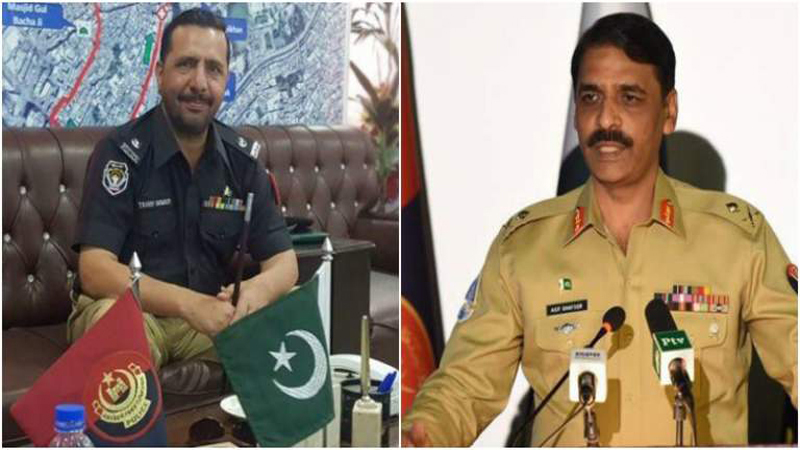 “SP Tahir Dawar’s abduction, move to Afghanistan and follow up behaviour by Afghan authorities raises questions which indicate the involvement or resources more than that of a terrorist organisation in Afghanistan,” Inter-Services Public Relations (ISPR) Director General Major General Asif Ghafoor said in a statement. “Brutal murder of SP Tahir in Afghanistan is highly condemnable. We have lost a brave police officer,” he added. “While investigations by Pakistani authorities are in process, we reiterate Afghan security forces to cooperate in border fencing and bilateral border security coordination to deny use of Afghan territory against Pakistan,” the statement concluded. SP Dawar went missing from Islamabad on October 27 and his death was confirmed by Afghan government on November 14. The police officer’s body along with his service card was found by locals in Nangarhar province of Afghanistan. An intelligence official, who talked to Daily Times on the condition of anonymity, believed that the handling of the incident by the Afghan government has clearly established that this entire episode right from the kidnapping of the police officer to his brutal killing and the ‘drama’ staged while handing over of his body at the Torkham border crossing was a ‘pre-planned affair’. He said Afghanistan initially refused to hand over body to representatives of the Pakistan government and instead insisted at handing it over to an individual associated with the Pashtun Tahuffuz Movement (PTM), adding that this move by Kabul was against all the international and diplomatic norms. The Afghan officials handed over police officer’s body to Pakistani authorities after a delay of two days. Led by Minister of State for Interior Shehryar Afridi, the Pakistani delegation waited at the border for whole day to receive the body. Reports said that Afghan officials initially refused to hand over the body to Pakistani authorities at Torkham. However, they later handed it over to Afridi, who was also accompanied by KP Information Minister Shaukat Yousufzai. In the meantime, Foreign Office lodged a protest with Afghanistan over delay in handing over the SP’s body. “We summoned the Afghan diplomat to the Foreign Office twice,” Foreign Office spokesperson Dr Faisal said during his weekly press briefing in Islamabad. “We lodged protest with Afghanistan over the delay in handing over of SP Dawar’s body,” he added. MNA Mohsin Dawar was also present at the Torkham border at the time SP Dawar’s body was transferred to Pakistan. Two days back, while Minister of State for Interior Shehryar Afridi had declined to respond to media queries about the purported killing of the police officer in Afghanistan, MNA from Waziristan and PTM leader Mohsin Dawar had confirmed on his Twitter handle that the images of a mutilated body circulating on the social media were that of SP Tahir Khan. The martyred police officer’s body was later dispatched to Peshawar via a helicopter. His funeral prayers were held at the Civil Lines Peshawar in the evening and was later buried in Hayatabad. In a joint press conference later in the day, Shehryar Afridi and Shaukat Yousufzai assured that the State will not compromise on SP Dawar’s murder. They also lamented the behaviour of the Afghan authorities during the body handover process. “We were made to stand at the border for several hours,” Yousufzai said. “The behaviour that we saw at the border today was painful,” Afridi added. “Prime Minister Imran Khan has already directed KP chief minister, IGP and Islamabad IGP to conduct inquiry into the killing and submit a report. A meeting will be held in this regard at the Prime Minister House at 3pm on Friday (today),” Afridi said. Reportedly, a joint investigation team is investigating as to how SP Tahir was kidnapped from Islamabad and later shifted to Afghanistan despite strict security in the capital and checking at security pickets near the Pak-Afghan border in Waziristan.